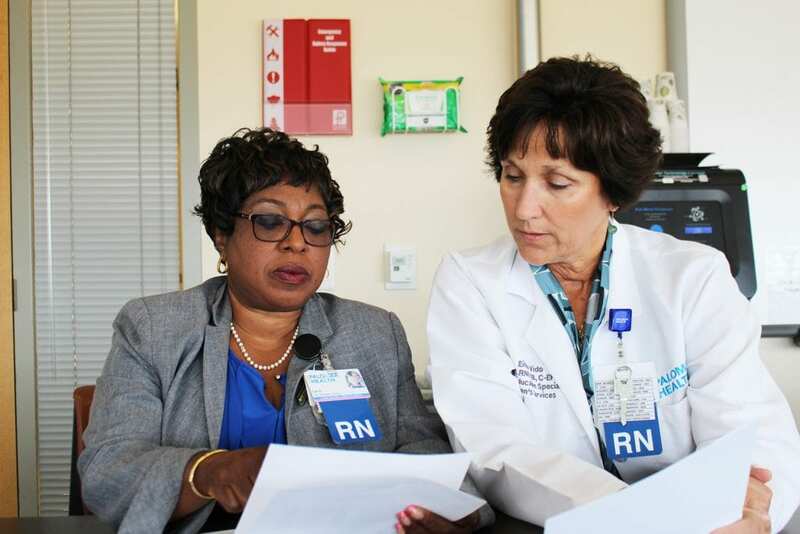 Liz Dawodu RN, director of Women’s Services at Palomar Medical Center and RN Eileen Vido, who is in charge of training nurses in the new protocols for minimizing C-sections. “The goal is a healthy mom and a healthy baby; however we have to get there,” says Registered Nurse Eileen Vido, Nurse Education Specialist with Women’s Services at Palomar Medical Center. For the past 18 months, she has been training nurses to avoid unnecessary Caesarian sections—which means more healthy moms and babies. Over the past year and a half the labor and delivery unit at Palomar Medical Center has reduced C-sections dramatically due to implementing new protocols developed by the California Maternal Quality Care Collaborative for Stanford University. The hospital’s birth center delivers about 3,000 babies a year, or from 250-300 a month. Research has shown that vaginal births are better for both baby and mother. National rates for C-sections peaked at 33% of all births a few years ago and are still more than 30%. Palomar’s rate has achieved about 19% over the past six months. By comparison, Sharp Mary Birch Hospital for Women & Newborns was over 28% according to their publicly reported data. For decades the percentage of caesarian births nationwide crept up until one in three were C-section, according to Palomar Health. According to RN Vido, some reasons for the change included reduced pain for mothers and because obstetricians increasingly wanted to deliver during regular working hours! Another reason was the theory that if labor went on for too many hours it would tax the mother, as opposed to the “old school” approach of letting labor take as long as it takes. Doctors and hospitals also feared the liability issues of long labors, and this led to excessive caution that often made C-sections the default. Increasingly studies have shown risks for baby and mother for elective C-sections, including life-threatening uterine rupture for women and a greater risk of stillbirth for the baby. Two years ago Palomar Health began implementing a new protocol to move the hospital away from an overreliance on C-sections. It doesn’t mean they aren’t used, only that they are just one tool in a toolkit available at the hospital’s birth center. The protocols recognize the old saw that doctors may be the boss, but nurses run the hospital. This reality is reinforced at Palomar’s birth center—and in fact the entire hospital—where, instead of the traditional “nurse’s station,” at a central location, individual nurses are “stationed” near their patients. Often doctors will take the direction from the nurses in charge, and if the nurse says a C-section is not called for, the doctor will take that direction. Fifty hospitals in California have signed on to reduce the procedures. In general they concentrate on new mothers so they don’t have C-sections, rather than trying to change things for returning mothers. Vido’s boss is RN Liz Dawodu, director of Women’s Services at the hospital. Dawodu notes that having a C-section “isn’t without risk or consequences for future pregnancy,” such as increased perinatal morbidity. There is a national focus on reducing the number of C-sections, especially the first one. If your first birth is a C-section you are overwhelmingly likely to repeat the procedure, she says. The protocol was introduced at Palomar in January 2017. “It has been successful, said Dawodu. “We have reduced the C-section rate and we now have one of the lowest rates in the County.” Training nurses to know the difference between a birth that is progressing normally, and one that requires a C-section means nurses can become a more informed advocate for the patient. “This gives the nurse a chance to work with her—not to fight the doctor—but to work with the patient,” she said. Any patient has the right to refuse a C-section. Usually, the hospital will support that decision unless the safety of the fetus is at risk. Although the ultimate goal is a healthy mom and a healthy baby, not all C-sections can be avoided. Births unaided by pain killers are also an option. “If someone chooses to go natural, we are on board with that,” said Dawodu. “Our goal is to have each one delivered vaginally,” says Vido. There are some relatively new tools that help achieve this goal. Such as the “peanut ball,” a barbell shaped pillow the mother can position between her legs to help with contractions. It helps keep the birth canal open and in the upright position. “Positioning on the peanut ball and birthing balls helps the baby to rotate,” said Dawodu. The nurses are educated to let labor go on a little longer than before, as long as the mother is not in any danger. “We can let it go longer, even if the patient is completely dilated,” said Dawodu. “This may let them labor down. As long as you are doing frequent positioning and different pushing techniques.” The birthing ball and peanut ball assist the mother to frequently change positions and vary the labor so she doesn’t become as tired. On my visit to Palomar’s birth center I met a first-time mother who had delivered the night before: Azucena Andrade, who with her husband, Oscar and new baby, live in Escondido. The baby boy, Nathaniel, is her first. At 8.3 ounces he is a hefty little one. The mother had a long labor. It began on a Monday morning and ended Wednesday morning. Nurse Vido observed, “In the old days they would have cut her. They would have been pressuring for a C-section.” This time the mother was NOT pressured. “We are letting your body do its thing,” Vido said. Persons who are interested in finding out more about this initiative can visit the CMQCC website, www.cmqcc.org. 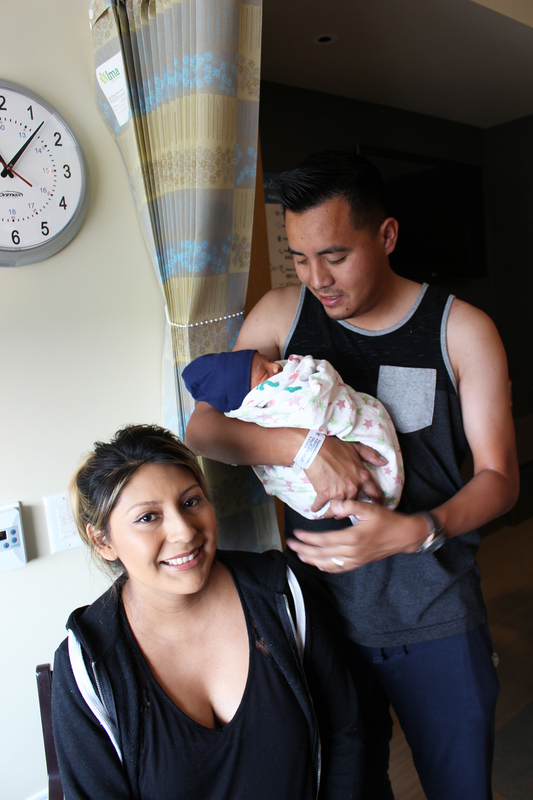 Azucena Andrade and her first born, a boy named Nathaniel, and dad, Oscar. When we talked to her she had given birth 48 hours before. She was very happy to have given birth naturally, without the C-section. Her labor took 48-hours, which, in the very recent past would have almost certainly have resulted in a C-section.